These eBooks are delivered as downloadable PDFs and can be viewed on any device capable of viewing PDFs. After purchasing, you will find the eBook downloads in My Account > Downloads. The content of these manuals meets the requirements of the EASA theoretical knowledge syllabus for the Air Transport Pilot Licence (ATPL) and complies with the ATPL learning Objectives published by EASA. Many diagrams, most of them in colour are used to explain the more difficult concepts and the majority of chapters include multiple choice questions which allow students to check their progress. 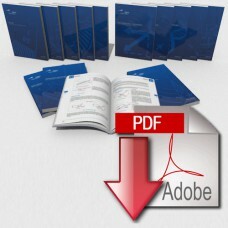 The complete set of 14 CAE Oxford Aviation Academy EASA ATPL training manuals has over 6500 pages. Each book is a separate PDF file; file sizes are in parentheses. ATPL 11: Performance Based Navigation (2.13MB) download is also included with a purchase of this book.